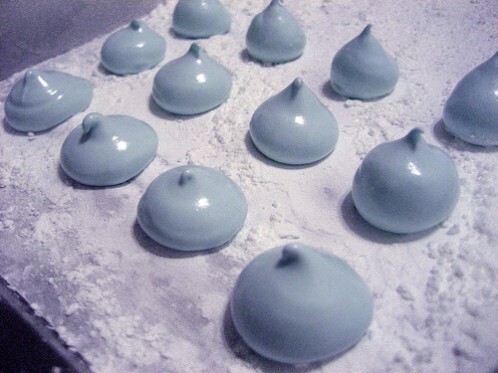 Stun guests at your next work function or gathering with these Dragon Quest -themed confections. St. Patrick’s Day is nearly upon us, and you know what that means: Chicago will dye its river green, San Francisco will be drunk by 11am, and somehow I will have managed to paste a Wii remote to my hands with the stick of spilled booze. I think I’m going to invent the ‘Metroid,’ which will just be a cherry suspended in a shot glass filled with Diet Coke. Remember Super Bento Bros? Guess what. The artist decided to start up her own blog last month, and Kotaku found it. But that’s not all. She is writing how-to’s. 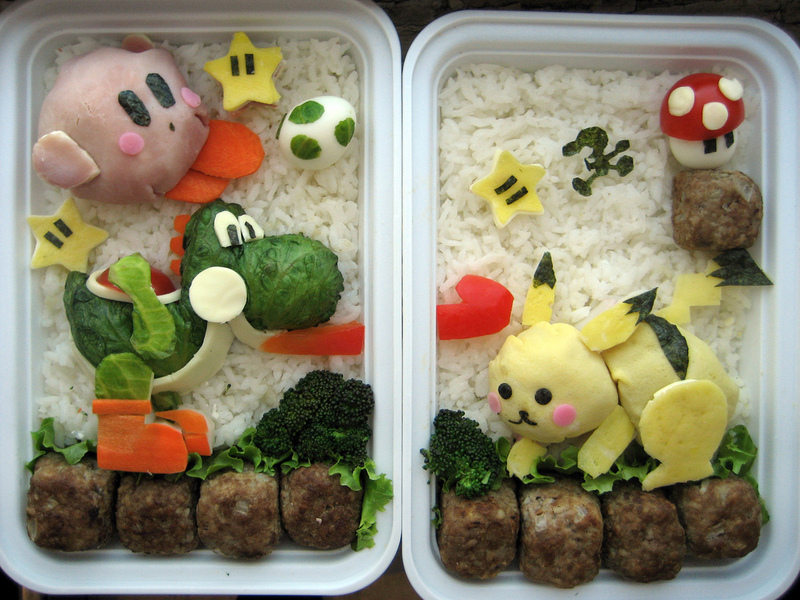 Personally, if I were the world’s greatest bento box artist, I would not tell anybody how I am working my magic. I would take those secrets straight to the grave. 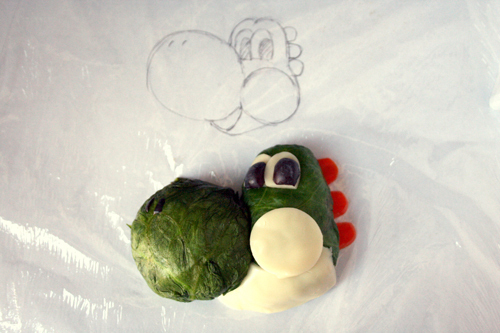 Every time I re-blog one of Jocelyn’s spectacular game-related confections, I am seized with terrific guilt. Let’s face it: I am robbing this poor woman. Love. Pure love. It’s my favorite cookie yet, and not just because Grim Fandango is a really neat computer game. Till now, I’d thought the cupcake renderings of 8- and 16- bit sprites were my favorites. After all, early game art—blocky pixel mosaics that represent more complicated imagery—is the nearest thing I can think of to painting in icing (cumbersome!). 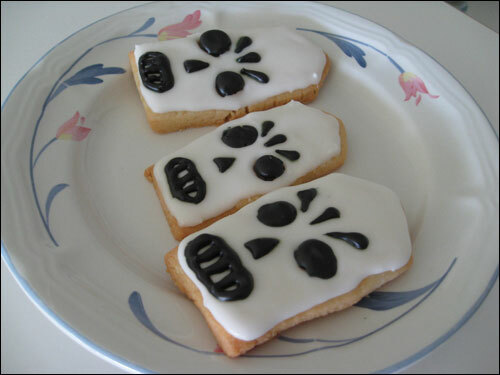 But the stylized art of Grim Fandango, itself based on the stark iconography of the Day of the Dead, somehow suits these little pastries perfectly. I swear to break myself of posting about baked goods. 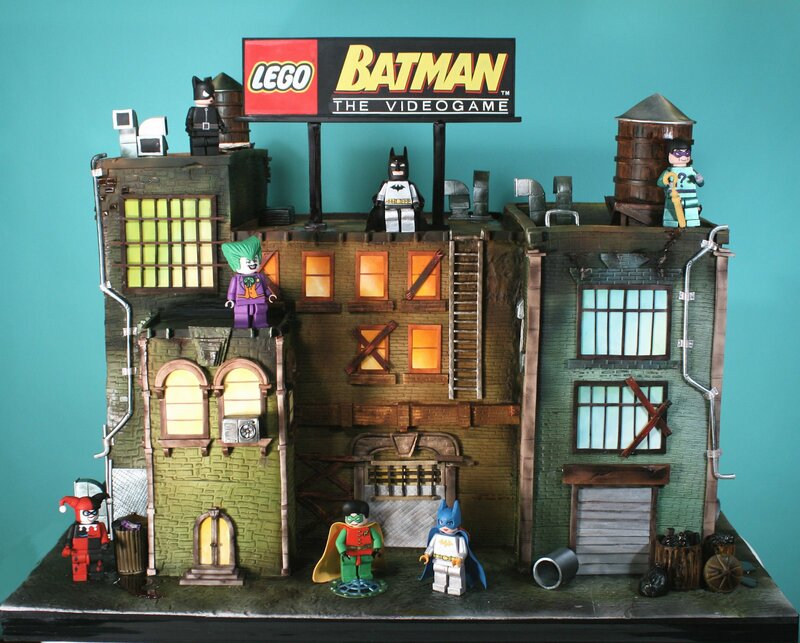 At the very least, I won’t do another toy or cake -related post this week. It took cake designer Elisa Strauss and a team of people twelve days to make this 300 lb (~136 kg) cake. The LEGO Men (and Ladies) are handmade and edible. I confess that I have recently avoided blogging about my favorite video game baking site, Snack or Die, because it seems unfair that I post whenever Jocelyn posts, stealing all her photographs. 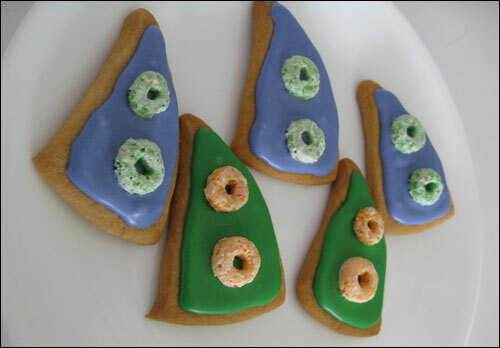 But Jocelyn’s brilliant Day of the Tentacle sugar cookies simply cannot be ignored. Sugar cookies themselves seem especially autumnal. The icing itself should be a cinch to mix. Apple Jacks cereal O’s make for perfect Purple Tentacle and Green Tentacle suction cups. All in all, what a neat Halloween baking project for any fan of LucasArts adventure games. Also—and this has nothing to do with baking—there is not much on YouTube in the way of the old Maniac Mansion TV show starring Joe Flaherty. That seems criminal! You guys. 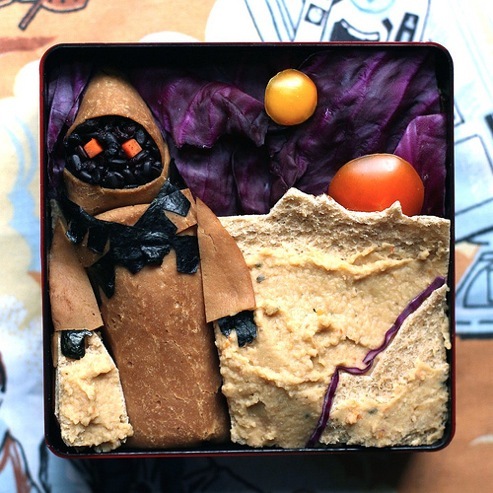 This is maybe more amazing than the Tatooine bento. Snack or Die is, without a doubt, my very favorite recipe website. I am always in awe: Jocelyn is the MacGyver of pastries. 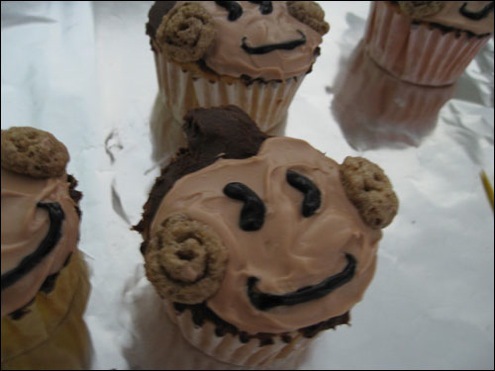 Her newest confection is a jarringly apt likeness of the Super Monkey Ball mascot, its visage rendered into a perfect little cupcake. The monkey’s most salient feature, curly-cue ears, is cleverly reproduced using cinnamon cereal puffs. And the miniature pompadour is simply a Tootsy Roll that has been painted over with chocolate frosting. OK, OK. The photo itself is from a few months ago, apparently, and this really doesn’t have anything to do with video games, I know. But I figure Star Wars devotees and video game players might have overlapping cultural interests, and anyway, I liked this. Ready? 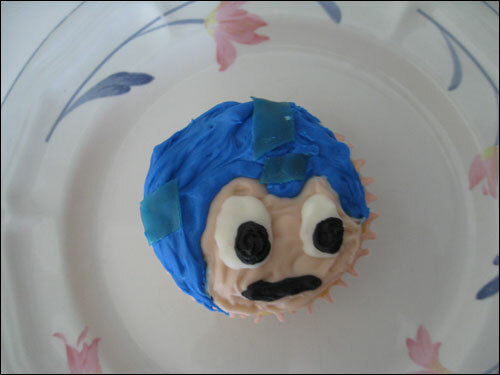 Snack or Die, the video game -themed baking recipe site, now proffers instructions for Mega Man cupcakes. This is one project I think I could try. 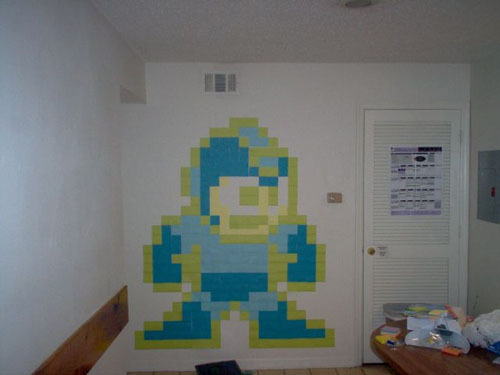 The recipe arrives just in time for next month’s Mega Man 9 living room launch party! And since I can just start with blank, boring cupcakes from the supermarket, I can pull this off without burning anything. Serve with E-Tanks, perhaps? And look at how cute and scrumptious and worried Mega Man’s little face is! 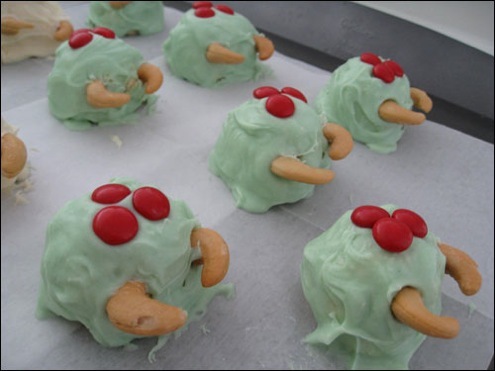 Snack or Die is a recipe website dedicated to video game -themed pastries. 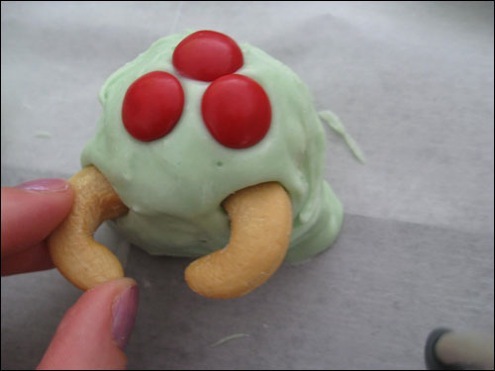 The how-to blog’s most recent addition, a recipe for Metroid Cake Balls, looks dangerously delicious. This Zebesian confection calls for cake mix, cream cheese frosting, and lots of white chocolate. Red M&Ms substitute for the iconographic nuclei, and the mandibles are scrumptiously unthreatening cashews.